The New Orleans Saints made no gripes about who they were interested in during the opening stages of the 2018 NFL Draft. 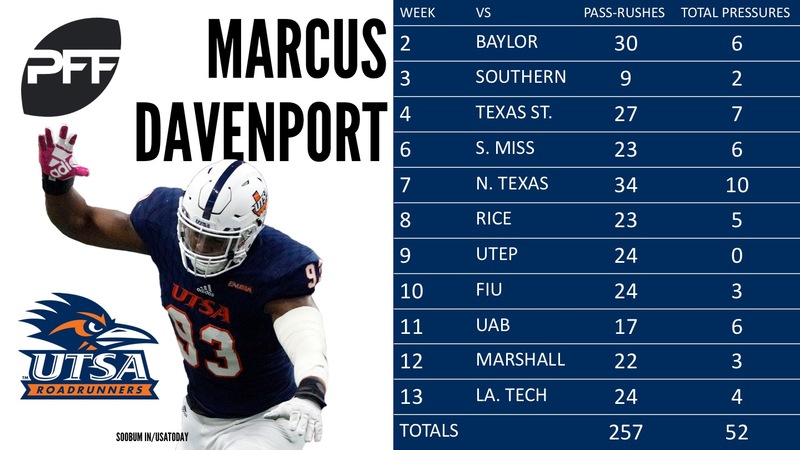 They traded up with the Green Bay Packers to select former UTSA edge defender Marcus Davenport, who stands 6-foot-6 and checked in at 264 pounds. He put together an incredibly impressive NFL combine, running the 40-yard dash in 4.58 seconds while hitting 22 reps on the bench press and recording a 33.5-inch vertical and 124.0-inch broad jump. Davenport’s prospects as a player are raw but he did have several highlight reels plays during his time with the Roadrunners and capped it all off with a four-hurry, one-sack performance on just 25 pass-rushing snaps at the Senior Bowl. While the Saints did offer a lot to secure Davenport (gave up a first-round pick next year), his potential off the edge for a Saints defense that has lacked there for a few years could have immediate impacts. On Day 2, the Saints selected deep threat and talented receiver Tre’Quan Smith from UCF. Smith finished last season with the second-best passer rating when targeted and hauled in over 70 percent of deep (20-plus yards) throws his way with the Knights in 2017. Offensive tackle Rick Leonard and Will Clapp were taken on Day 3 as was shifty, undersized running back Boston Scott from Louisiana Tech. Scott broke 41 tackles on the ground last season and averaged 3.9 yards after contact per carry. Double-dipping in the secondary position with back-to-back picks, New Orleans added Natrell Jamerson from Wisconsin and Kamrin Moore from Boston College to help bolster their back-seven. Jamerson was a sure-tackler during his time with the Badgers and Moore had decent overall grades buoyed by his coverage prowess during his time with the Eagles.